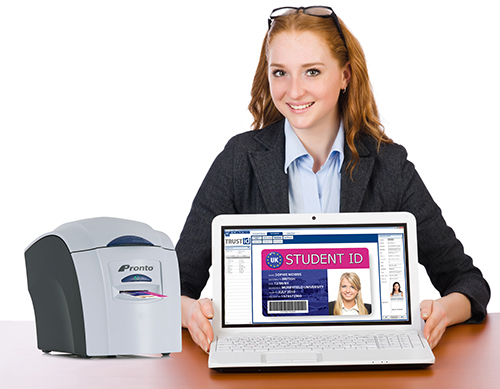 A compact, versatile ID card printer for lower volume issuance ? ideal for membership clubs and small businesses. Incredibly easy to use with drop-in dye film and hand-fed card loading. The Pronto features magnetic stripe or encoding options .It offers edge-to-edge and sharp image quality for simple and easy card printing in a compact and highly reliable package.The Magicard Pronto printer delivers low cost printing and free card visual security as standard with four HoloKote watermark designs.The Pronto is supplied with a free, 2 year depot warranty. Lightweight but robust, the Magicard Pronto?s small footprint makes it ideal for a reception desk or an office environment. Its portability and versatility comes with no compromise in print performance, making it ideal for remote ID card issuance at events or in the field. Print vibrant full colour cards or use thermally activated rewrite cards ? and print, erase and rewrite in monochrome. Rewritable cards are ideal for visitor management or for loyalty card printing.